Working with the Chowfather on making an "underground dinner club" thing happen here in Miami. Given that it's Miami, "underground" is not so easy to do (we're at sea level and all), but the idea we were both kicking around was to assemble a group of adventurous diners willing to serve as guinea pigs for local chefs looking to try out something new or different. A first event is already being planned. More info to follow at Cobaya - Gourmet Guinea Pigs. Life is not all Michelin three star dining experiences. Sometimes, all you want is a good cheap meal - a burger, a sandwich, something that satisfies your hunger without draining the wallet. Over the past few weeks I've been to a few such places and thought I'd try to add it all up. Somehow I missed out on all the brouhaha over Five Guys. Indeed I was actually more familiar with In-N-Out, a similarly regarded but exclusively West Coast chain, than I was with Five Guys, which originated in the Washington DC area. But good reports started coming to my attention here and there, so when an opportunity presented itself I popped in to the Midtown Miami Five Guys location and tried it. Like In-N-Out, the menu is minimalist in approach though with a slim few more options (but no "secret menu" to my knowledge) - burgers, with cheese and/or bacon (or without); hot dogs (ditto); and fries, "Five Guys style" or Cajun. Burgers are available with a fairly traditional lineup of condiments, along with a couple not-terribly eccentric outlyers like bbq sauce, jalapeños or green peppers. Free peanuts in the shell while you wait in line is a nice touch. Maybe I'm a fussy little nancy-boy, but I am usually underwhelmed by any burger for which you cannot specifiy your preferred degree of doneness, since I'm not a fan of well-done. But Five Guys makes up for this in a couple of ways: first, they stack two thinner well-done burgers together, giving the illusion of a nice fat burger; and second, what the burger lacks in lightly cooked juiciness, it makes up for in well-cooked greasiness. Not that that's a bad thing, necessarily. I had a cheeseburger with their routine "with everything" toppings (ex- mustard), which brought a nice combination of ketchup, mayo, fresh crisp iceberg lettuce, a slice of tomato that actually tasted like one, grilled onions and mushrooms. The onions and mushrooms were a nice (free) addition that also helped make the burger seem juicier. The patties were nicely scraggly and imperfect, reflecting a burger that has not been overhandled. The bun was toasted on the griddle next to the burgers, which were cooked and assembled to order. This was a darn good burger, especially for $5. The fries, about $2, not so much. Though it's clear they're using fresh potatoes (indeed they've got the bags piled up right in front of the counter to show you) and provide an over-generous serving, "Five Guys style" apparently means undercooked and undersalted. And unfortunately there are no other options in the way of sides other than said fries. Maybe the Cajun spice works some wonders on these. But it'd be nice to have something to match the satisfaction level of the burger, which was quite high indeed for $5. In contrast to Five Guys, which takes the mass-production burger chain model and elevates it with some attention to quality, 8 Oz. Burger Bar comes from the opposite direction. 8 Oz. 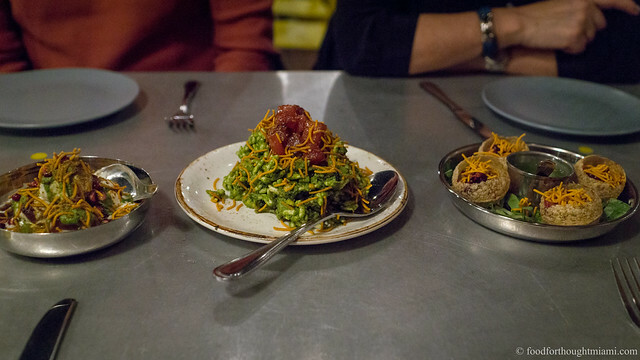 is the brainchild of Chef Govind Armstrong, until recently better known for Table 8, a fine dining restaurant in Los Angeles, and its progeny in South Beach. Like many chefs looking for ways to ride out this economic cycle, in May of last year he closed Table 8 L.A. and reopened it as a burger joint, 8 Oz. Burger Bar. When Table 8 L.A. closed, it was reported that it would be reopening in another location in a few months; I don't think that ever happened, though Armstrong did recently open another Table 8 in New York. In February, Chef Armstrong opened an 8 Oz. in South Beach, on Alton Road. Now another one has gone into the Z Hotel where Table 8 South Beach (just closed this week) is located. While 8 Oz. tries to come across as somewhat proletariat, this is a burger joint for fussy nancy-boys (like myself), with burgers made from a special in-house grind of sirloin, tri-tip, short rib and chuck which is "cured in a Himalayan salt locker." Or, if that's not fussy enough for you, there's also an Estancia grass-fed beef burger, or lamb or turkey burgers too. The menu has a list of about 5 or so pre-composed burger assemblages, or you can craft your own from a selection of cheeses, sauces and other toppings. And yes, you can specify your preferred degree of doneness. I chose a "Melrose" burger, a daintier 6 oz. portion of their "house blend" topped with arugula, garlic roasted tomatoes and red onion marmalade, medium-rare, to which I couldn't resist adding some Humboldt Fog, one of my favorite cheeses. (Note, by the way, that the menu I was given was much more limited than the one that is available online. While it offered most of the cheeses, it probably had less than half of the other sauces and toppings listed on the online menu. I also couldn't find any of the snacks or other items listed online other than the sides. And prices "on the ground" are generally a tad higher as well). This burger was so immaculately formed that it almost appeared to be one of those mysterious Boca Burgers with the grill-marks airbrushed on. I don't know if I have ever seen a patty so perfectly round. Unfortunately, my "medium-rare" request was apparently for naught, as I could barely discern any hint of pink. And the meat, as several people have previously noted, was undersalted and consequently somewhat short on flavor, even though the "house blend" tried valiantly to overcome the stingy seasoning. That Himalayan salt locker just isn't cutting it - need to add more salt. The "Melrose" toppings were quite nice if just a tad on the sweet side. And while Humboldt Fog on a burger may sound like a great idea (at least it did to me), the actual execution is not quite as exciting. A little wedge barely covered 1/3 of the burger, and the cheese, soft and mushy but not quite melted, didn't hit the right notes texturally (though for this pairing I recognize that I only have myself to blame). The onion rings had a slightly sweet, not quite crisp batter which I didn't love at first, but found I couldn't stop eating these anyway. The beer selection is a real high point. Not many options on tap (indeed just Shock Top wheat ale, courtesy of Anheuser-Busch), but a plethora of bottled micro-brews made up for it. My Rogue Dry-Hopped Red Ale was a nice medium-weight beer with some hoppy bitterness that would have happily cut through even a much greasier burger. The place has a nice casual vibe, with sports on the TVs and loud rock-n-roll on the stereo. I'm not sure if the guy next to me at the bar singing along to "Sweet Child of Mine" was getting warmed up for it, but I swiftly and happily made my exit just as Monday Karoake Night was getting started. At $8.50 for the burger, an extra $2 for the Humboldt Fog, $4 for the rings and another $8.50 for the Rogue Ale ($23 total), this turned out to be not quite the cheap meal I expected. Maybe I should have donned a trucker cap and drank PBR instead. But even the abbreviated menu still offered more interesting and varied toppings than you'll find at most conventional burger joints. Now if they could just loosen the grip on the salt shaker and let that "house blend" really shine. Possibly my favorite of the three places in this list is "The Spot," a newly opened sandwich place in a location along Alton Road which I think previously housed a Colombian place, Primarepa. This is another short and sweet menu with basically a choice of fried shrimp and fish and a few other items, available either on a platter with some sides or as a po'boy. I went with a fried jerk-spiced shrimp po'boy and was not at all disappointed. A slightly crusty long roll was opened up like a book and stuffed with several plump medium-sized shrimp, crispy outside but still distinctly recognizable as shrimp, not battered and coated into oblivion. This was not real Jamaican jerk spice by any means, just sort of mildly spicy, but still nicely flavorful. The shrimp were topped off with fresh shredded lettuce, decent tomato, and the clincher for me, a creamy spicy remoulade sauce, and a goodly dose of it too. The sandwich is generously stuffed and the server advised me of his preferred technique of using a fork to push back in the contents while gently squeezing the bread together a bit to get it ready for noshing. I can't help but say it - this po'boy just really hit the spot for me. There was a short list of sides available, including a couple typical soul food items. I went with the Cajun fries, which were nice and crisp but the spice mix was overwhelmed by paprika. They actually reminded me in that respect of one of the trio of duck fat fries that come as a gratis appetizer at Bourbon Steak. Po'boy, fries and a bottle of water set me back somewhere around $11 total. One other thing The Spot has going for it is late hours - apparently open till 2am and possibly even later on weekends. You saw the pictures, now you can read a write-up of my last great meal at NAOE in Dine Magazine South Florida. I've previously written about NAOE, which was one of my most memorable local dining experiences of the year. I've been back a couple times since and while the choices have changed, the quality was at the same level and the experience just as satisfying. 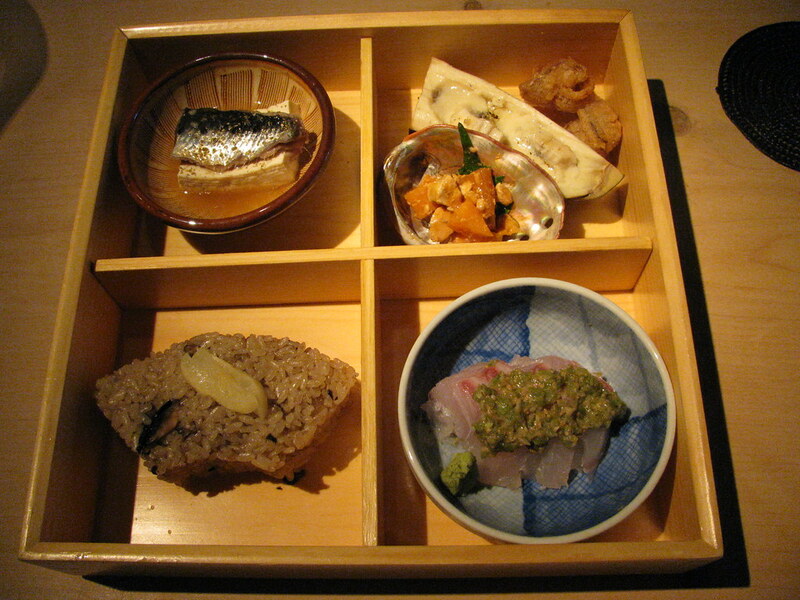 Chef Cory has gotten somewhat more efficient, with only about a 20-30 minute wait for the bento box - though sampling all the nigiri he has to offer will still be a 3-4 hour affair. On my last visit earlier this week I brought a camera; this time I'll let the food do the talking. You can read my description of this meal at South Florida Dine Magazine, and you can see all the pictures on this flickr set. mutton snapper sashimi fresh from Haulover Marina, with an okra-miso sauce. 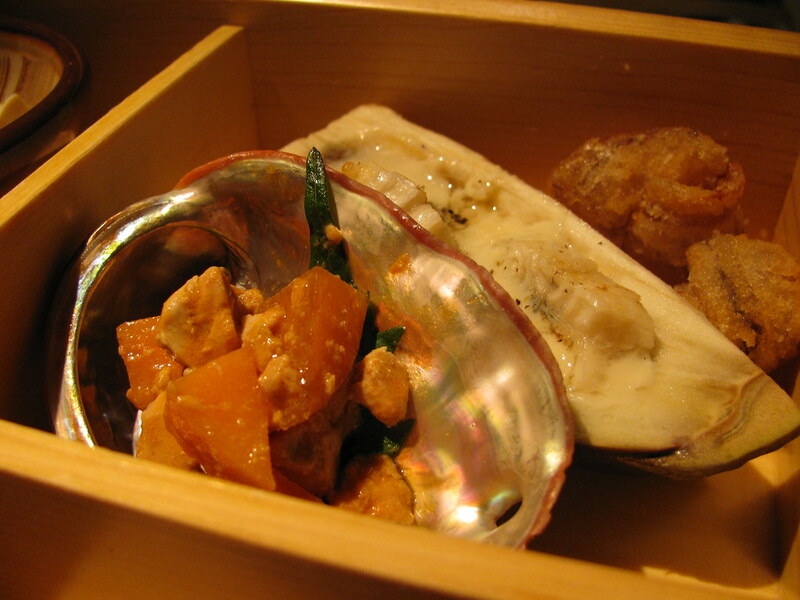 ankimo & persimmon with shiso leaf; steamed eggplant topped with fresh-water eel; fried citrus-marinated scallop mantle. 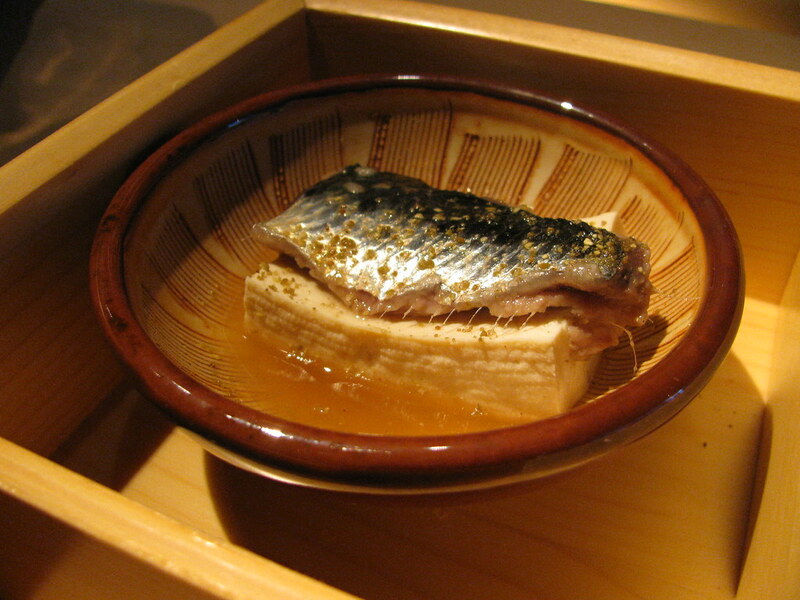 iwashi (sardine, from Oregon) over organic tofu steamed in sake and sprinkled with sansho pepper. 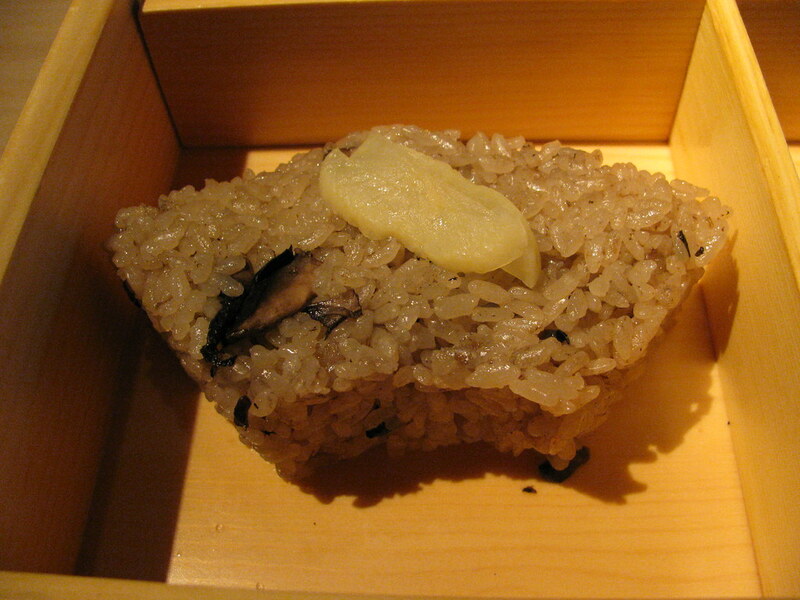 portobello mushroom rice topped with koji-zuke daikon pickles. 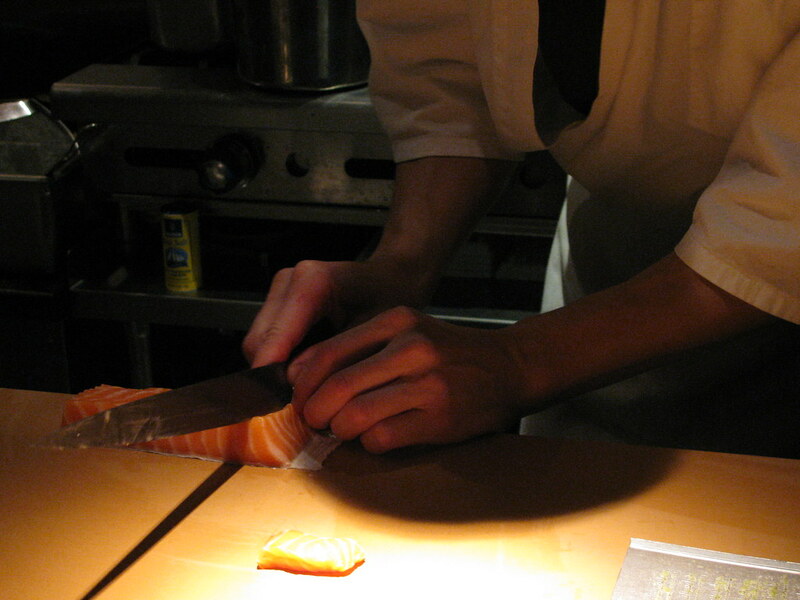 Chef Kevin Cory slicing Scottish salmon belly for nigiri. 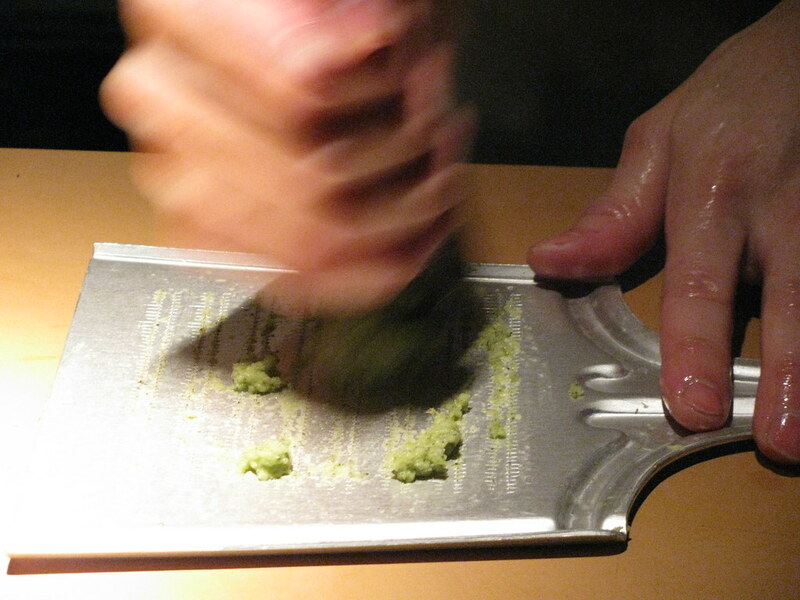 grating fresh wasabi for the nigiri. 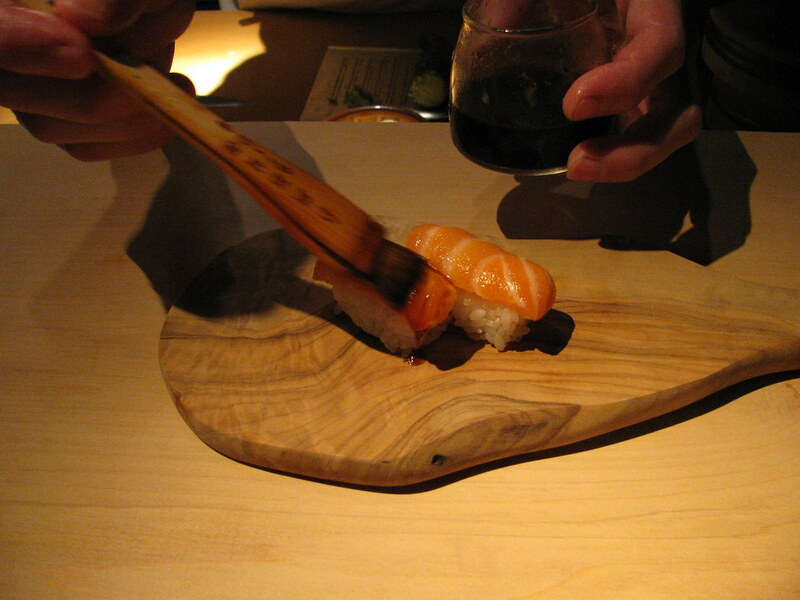 brushing the salmon with shoyu. Chef Cory skinning iwashi (sardine from Oregon). 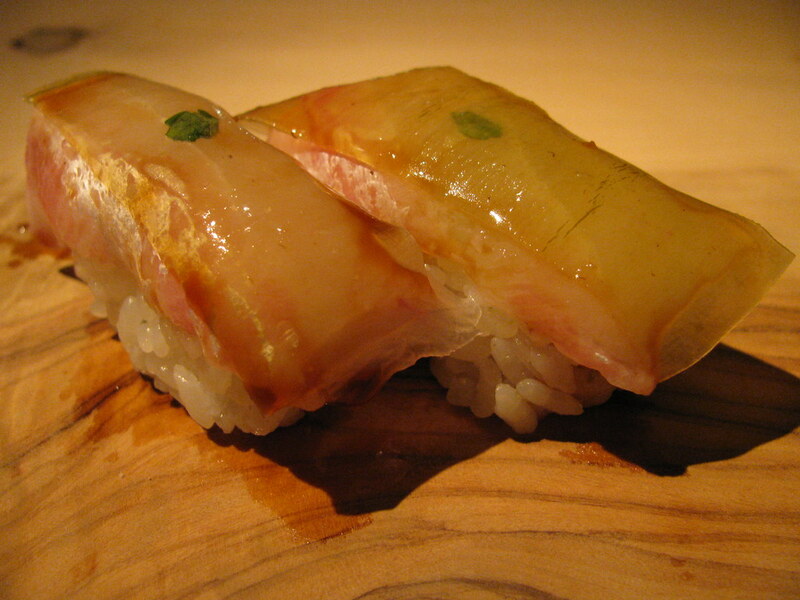 iwashi nigiri with freshly grated ginger. 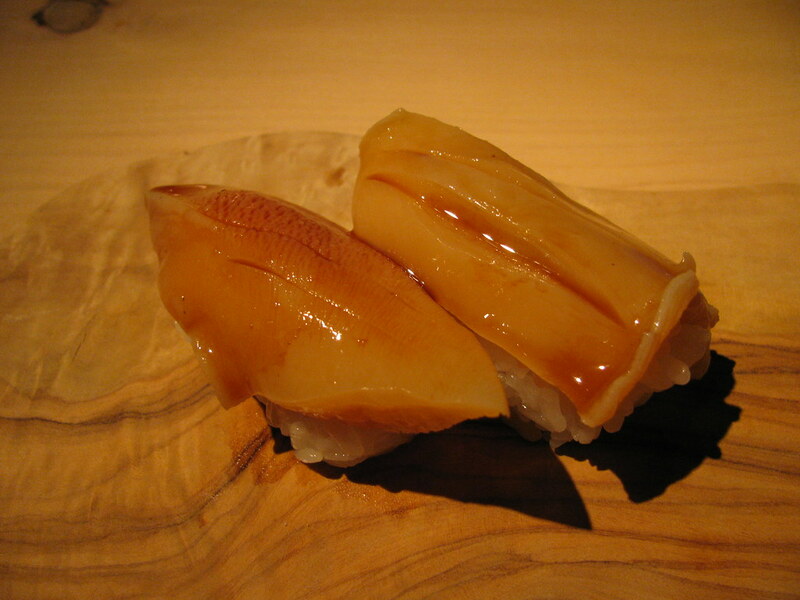 aoyagi (orange clam) nigiri brushed with orange-flavored shoyu. 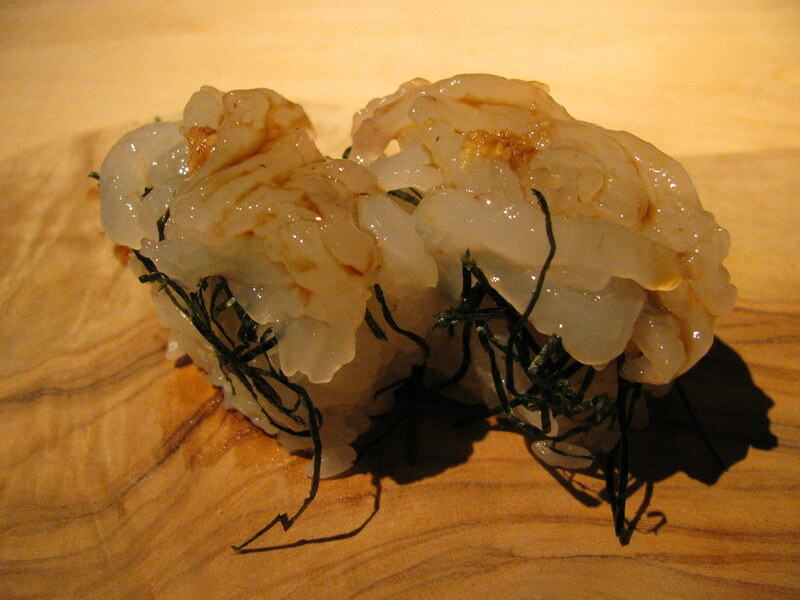 shira ebi (tiny white shrimp) nigiri. 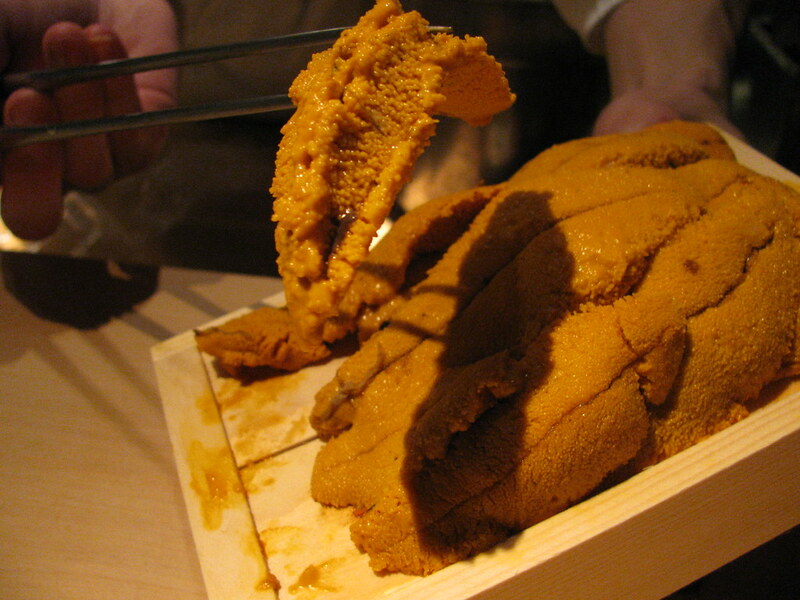 uni (sea urchin roe) from Oregon - possibly the best I've ever had. 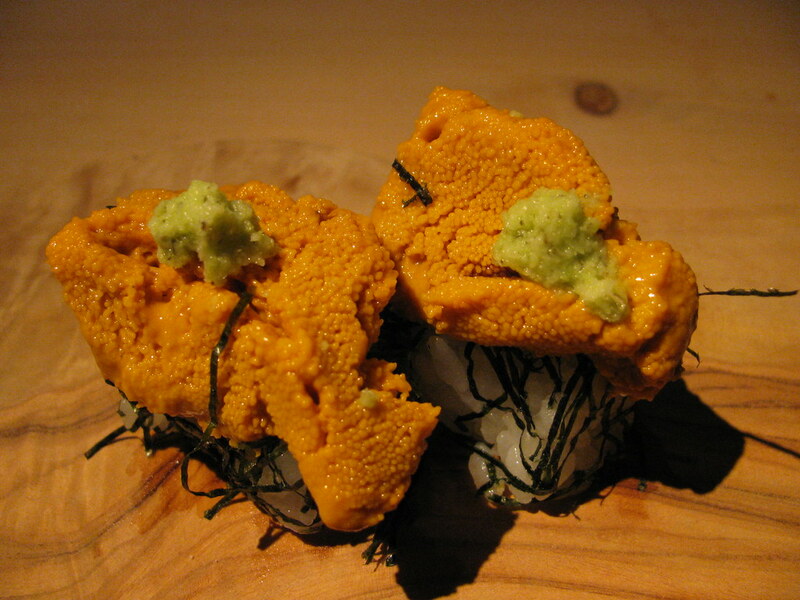 uni nigiri with freshly grated wasabi over shredded nori. 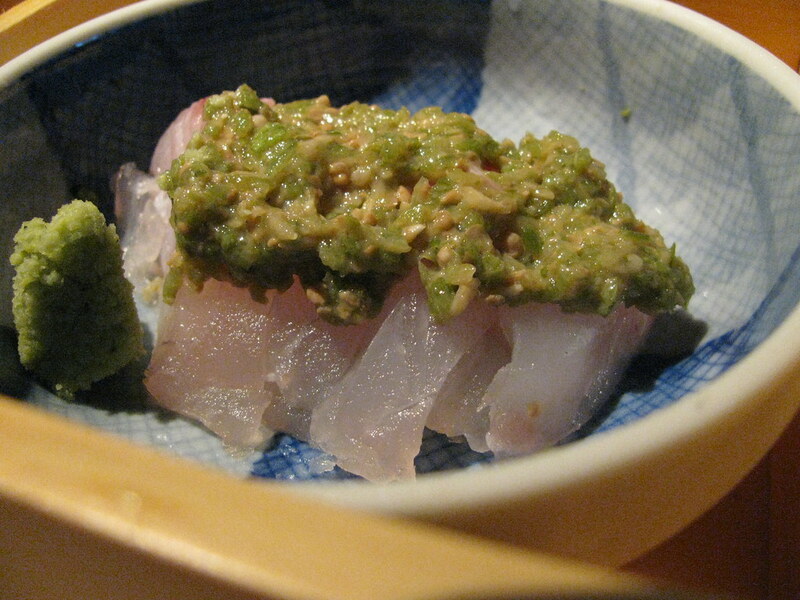 madai nigiri topped with battera kombu and shiso. 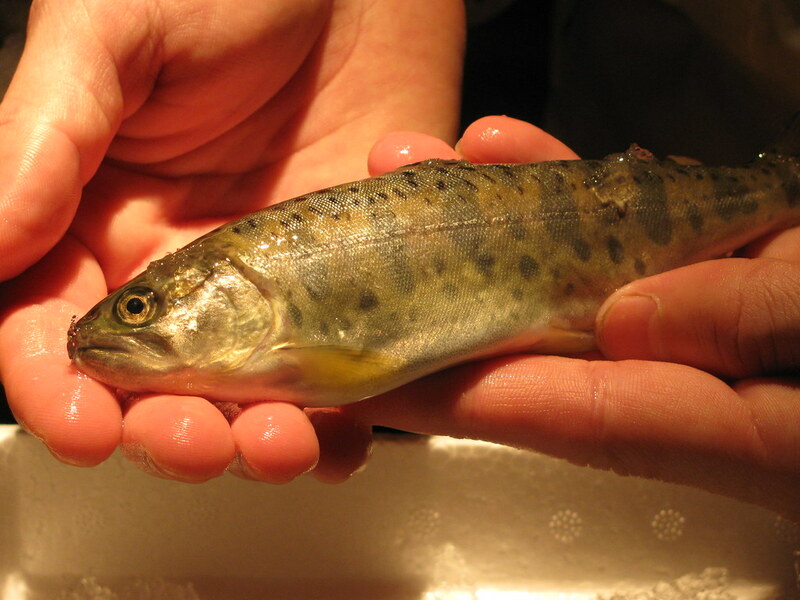 iwana, shipped fresh from Japan. sake from Chef Cory's family in Japan, and a view of the kitchen. In belated celebration of Bastille Day, I figured I ought to finish off my thoughts on Petit Rouge, which we visited for the first time last weekend. I've noted previously how there is something immensely comforting to me about the classic French brasserie menu. Escargot, onion soup gratinée, frisee aux lardons, duck confit, steak & frites, potatoes sardalaise ... it's all good. Even though I have no real personal connection with the country or its food, I know this food, I enjoy it, and it's a true pleasure when executed correctly. Petit Rouge gets it right. The menu was fairly close to the one linked to above with a few tweaks. We started with a tarte flambée for the kids to split as an appetizer. Tarte flambée is basically an Alsatian pizza, a flatbread topped with crème fraîche, sautéed onions and bacon, with perhaps a slightly crispier crust than the average Neapolitan pie. Petit Rouge's had a nice crispy crust, and a great mix of creamy, salty and sweet from the toppings. Mrs. F and I waited patiently for the kids to have their fill and then ravenously descended on what they left behind. Though there was much on the regular menu's list of appetizers that was tempting, I was even more tempted by one of the daily specials recited to us - duck rillettes. A generous mound of rich duck confit, pulled and shredded and moistened with some duck fat, served with a nice little salad of frisée and other greens, along with some cornichons and olives and some croutons for shoveling. Nice, simple and delicious. Mrs. F started with a salmon tartare, done with nice fresh fish and all the classic pairings (chopped egg, capers, onions, a bit of crème fraîche). I followed with another daily special, house-made boudin blanc. Boudin blanc is a light-colored, mildly flavored sausage, usually involving some combination of veal, pork or chicken, along with cream or milk. Petit Rouge's version included two gigantic plump links, served along with some nice mashed potatoes (rich but not overly creamy, and addictive) and braised red cabbage. Very nice boudin blanc, which I'd be prepared to say was possibly every bit as good as the one I had for breakfast at Thomas Keller's Bouchon in Las Vegas. The rest of our dining crew had an assortment of other items - bavette steak in a red wine jus with frites (and good frites they were), Scottish salmon with a provençal tomato sauce, frisée aux lardon topped with an oozy poached egg and a bacon vinaigrette, and a macaroni and cheese with a crispy topping of bread crumbs and golden-brown toasted cheese. All were done properly and hit all the right notes. For dessert, Frod Jr. was, of course, sucked in by the immense gravitational pull of a flourless chocolate cake, while Little Miss F went with a tarte au citron. The chocolate cake was one of the few items that didn't really impress, striking me as a bit dry and underflavored. The prices at Petit Rouge are also designed to please, with almost all entrées under $25. It was particularly appreciated that the boudin blanc special I ordered turned out to be only $18, actually less than many of the items on the regular menu. The wine list follows suit - we had a 2007 Jean Descombes Morgon for $35 which, while perhaps not a fantastic bargain from a markup perspective (the wine retails for anywhere between $10-20), was nonetheless a great price point, and there were several other selections in this range. Petit Rouge is in a tiny shoebox of a space on Biscayne Boulevard just north of 123rd Street which used to house another French restaurant, the short-lived Plein Sud. Based on our visit, I suspect Petit Rouge is going to be there much longer. What Do Yelp and Tripe Have in Common? I'll admit it. I was once "Yelp Curious." I was younger, and I experimented with it, and I found out it just wasn't for me. For me it was just a phase. But to each his own, live and let live, and so on. I believe in tolerance. 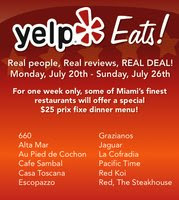 So I have no hesitation in noting that Yelp has come up with something that caught my attention: "Yelp Eats! Week." From July 20 - 26, a dozen local restaurants will be doing special prix fixe dinners at $25. A few things impressed me: (1) $25! 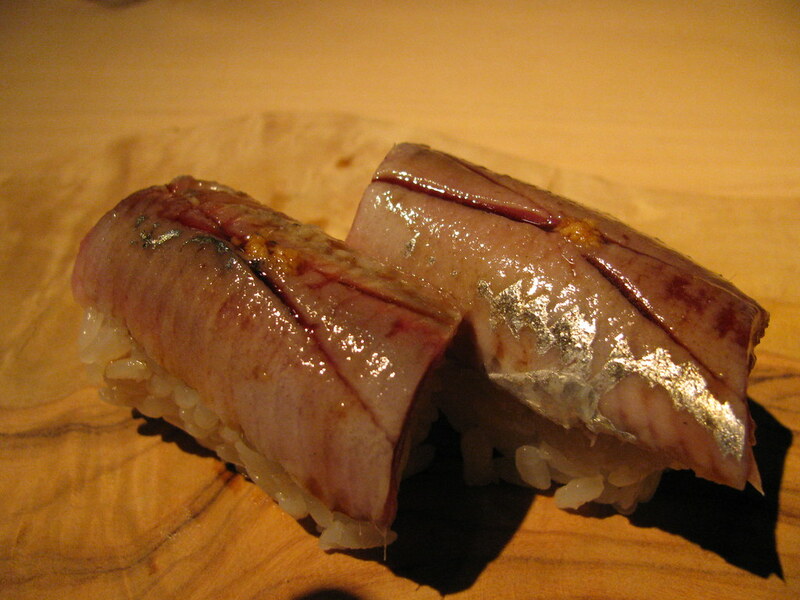 (2) it seems some efforts were made to discourage restaurants from just offering the "same old" (i.e. the Miami Spice trifecta of chicken paillard, skirt steak, and farmed salmon), with some of these menus actually showing some variety; and (3) andouillettes?!? Among three entrée choices at Au Pied de Cochon is the rather innocent sounding "grilled andouillettes." Which, for Mrs. F and me, brings to mind a dining experience from our younger days. Not long after we were married, we took a trip to Paris for a week. One of our first meals when we were there was at Le Procope. Le Procope was founded in 1686 and is said to be the oldest operating restaurant in the world. It was the haunt of folks like Voltaire, Rousseau, Balzac and Hugo. There is a hat on display which was supposedly left there by Napoleon. Neither Mrs. F nor I speak French, and so we were phumpering our way through the menu (since then, I've developed a savant-like ability to read menus in several languages even though I am otherwise completely incapable of communicating in any language other than English). I ordered a duck dish, while Mrs. F saw something called "andouillettes," and figuring it be something comparable to an andouille sausage, which we were familiar with, she ordered it. Our dishes came out, my duck looked quite nice, Mrs. F's looked like a large, greyish beige sausage. I started to dig in, and she took a bite of hers. She's looked at me, and I couldn't quite make sense of her expression. It was initially puzzlement, but then shifted to mild distress. After a lengthy pause, she said: "I just bit into something. It wasn't meat. It wasn't fat. I don't know what it was. It felt like a rubber band." Another pause. "And this smells funny." We switched plates, and I had the dubious privilege of eating the rest of the andouillette. It turns out that andouillette is a particularly visceral tripe sausage, usually coarse ground, and often with pork intestines in the mix as well (hence that rubber-band texture). It has been described as "a pale, lumpy sausage made from pigs’ intestines that smells like a pissoir," and "like chewing on rubbery . . . poop." Apparently Seattle chef Tom Douglas' assistant recently made the same andouille/andouillette mistake that Mrs. F made, and likewise concluded that "it wasn't my cup of tea." Needless to say, the French have an association dedicated to their appreciation, the Association amicale des amateurs d'andouillette authentique (or AAAAA). I have enjoyed more than my share of tripe in the intervening years, and have even started to come around to pig intestines, though I'm convinced there must be a better way of preparing them than the simply grilled chinchulines that are often served at Argentine parrillas. So of course I now feel obligated to pay a visit to Au Pied de Cochon to see if they're serving real-deal andouillettes, and if so, whether I'll like them better than the first time. Somehow I think Mrs. F will be sticking with the duck. Paradigm Series Named "Post of the Month"
Thanks to South Florida Daily Blog and its readers for voting the three part series documenting my experience in the kitchen for a "Paradigm" dinner at Neomi's in Sunny Isles as the June "Post of the Month." Look what we started! In today's New York Times: The Cult of the Artisanal Pizza - Crust Is a Canvas for Pizza's New Wave, with comments on nearly a dozen new New York pizzerias. Can't wait for the "What does Bruni know about pizza?" chorus from the NY pizzerati to begin. Por Fin in Coral Gables is offering the chance to "Experience the Running of the Bulls Without Getting Gored." In celebration of the foolhardy annual tradition of running down Pamplona's cobbled streets with six one-ton bulls in chase (typically after staying up all night drinking the evening before), Por Fin is offering two-for-one drinks (including sangria and kalimotxo, the red wine & cola concoction that is one of the Basques' few uncharacteristically questionable contributions to gastronomy), $5 tapitas, and flamenco music from 5:30 p.m. to closing on July 8-12. Only four people were injured in the opening day of this year's run. Hopefully Por Fin's body count will be even lower. Meanwhile, UrbanDaddy reports that Solea, a Mediterranean (hey - at least it's not a steakhouse!) restaurant in the new W Hotel South Beach, is open for business, and gives a link to the Solea menu which shows some prominent Spanish leanings. While UD picked up that the restaurant is managed by the same folks who run Quattro on Lincoln Road, New Times' Short Order adds that the chef team is Michael Gilligan (formerly of Atrio in the Conrad) and Norman Van Aken protege Arthur Artiles (last at the now-closed Brosia in the Design District). One of the unofficial rules of "Pizza Crawl," starting with the "Joey's Pizza" at Joey's Wynwood, is that if there is a pizza named after the restaurant, then it must be ordered. Unfortunately, the "Sosta" pizza made little impression, other than that the sun-dried tomato spread with which it was anointed instead of sauce was too sweet. If there was burrata, it was wasted, as it was was indistinguishable from the mozzarella. The carpaccio pizza, topped with slices of raw beef which in short order were cooked pink from carry-over heat, was likewise curiously underflavored, the beef tasting like not much of anything when raw, and like under-salted steamed roast beef after it sat. The Siciliana fared better than the others, simply because its flavors (anchovy, caper, olive, basil) were bolder, and used decent quality ingredients (a pit in one of my olives was testament to them not using pre-pitted olives). The brie and speck also just wasn't doing it for me, but that may just be a matter of personal preference. The crust on all of their pies was good if a slight bit soggy, but likewise surprisingly lacking in flavor. Having heard some very good things about Sosta, I had expected it to fare better. Maybe we just had an off night there. Piola has its roots in Italy (Treviso, to be exact, which - someone please correct me if I'm wrong - is not exactly pizza headquarters of Italy; it has a location in Naples as well, but it's Naples Florida, not Naples Italy), but has an even stronger presence in Brazil where it has 9 outlets. The menu, even more encyclopedic than Sosta's with over 50 pizza options all prepared in a wood-burning oven, shows a distinct South American bent. We tried one of these, the "Curitiba" with catupiry cheese, hearts of palm, artichokes and mozzarella. While the creamy catupiry cheese was an interesting change of pace, it was something of a one-note wonder, and the hearts of palm and artichokes tasted straight from the can (and we're not talking any artisanal Spanish canned goods either). The "Piola" was bland, and the "Carbonara" had not been given sufficient time for the bacon to crisp so it tasted fatty and flabby. The "Posillipo" was found in a separate section of the menu and was described as a version of a traditional Neapolitan style pizza, supposedly shaped smaller with a thicker crust and edges. I could detect nothing different about the crust other than that the cornicione was perhaps a wee bit wider. The anchovies it was topped with were saltier and furrier than those at Sosta (and I am a big anchovy fan, so this is no slur on anchovies generally), and the one cherry tomato I came across was green and under-ripe. I've had good pizzas at Piola, but this was also a pretty disappointing showing. At least we closed out the evening on a high note. At Spris we easily had our two best pizzas of the night, their Carbonara and their Patate e Pancetta. The Carbonara had nice crispy pancetta, an oozy fried egg, big shards of shaved parmesan, and a fine dusting of ground black pepper. The Patate e Pancetta, though somewhat similar, was also done well, with thinly sliced potatoes that were both tender and a bit crisp, salty pancetta, more of that generously shaved parmesan, and a whiff of rosemary. This was a vast improvement over the similar "Genovese" pizza at Andiamo we had in Round 1. The Ortolana was a difficult pizza to share, because the assortment of vegetables - roasted green peppers, grilled eggplant, thinly sliced zucchini, portobello mushrooms - were artfully arranged in separate sections rather than scattered. Aside from the arrangement, though, I felt the ratio of topping to crust on this pizza was out of whack, way too laden with vegetables even if it was generous. The Frutti di Mare, while an interesting idea, will not cause anyone to forget New Haven style clam pizza any time soon. I couldn't really detect any seafood other than ringlets and more ringlets of calamari, which were a bit bouncy (probably breaching the "2 minutes or 2 hours" rule for cooking calamari by virtue of their time in the pizza oven). While Spris certainly was the best pizza of the night (the two best pizzas actually), I wouldn't put it ahead of either of my winners from Round 1 and Round 2 - PizzaVolante and Racks. Update: For other takes, here are links to Mango & Lime (with pix!) and Blind Mind's recaps of Pizza Crawl Pt. III. [*]Another crawler has suggested a "Cheesecake Factory / Nexxt Cafe" like similarity between Sosta's menu and that of nearby Spris. I'm not sure I agree. Several of these are pretty common pizza nomenclature - "capricciosa" for a pizza with ham, mushrooms, artichokes and olives, "quattro stagioni" for the same done in four separate sections, "ortolana" for a vegetable pizza, "diavola" for spicy sausage, - and others are just common ingredients - prosciutto cotto e funghi, tonno e cipolla, etc. Buried in a footnote to my last post was the comment that the presentation of a caviar dish with six foams at an old-school, traditional restaurant like Bern's Steak House in Tampa supported my contention that there is no such thing as a "molecular gastronomy restaurant." To which a commenter queried, "How does that prove any point?," and suggested, kindly, that my disdain for the term "molecular gastronomy" was clouding my judgment. I suggested, instead, that it was all the steak and wine that was clouding my judgment. I actually have no disdain for the term "molecular gastronomy," I just think it is an inapt descriptor for any restaurant. "Gastronomy" is a field of study, not a school of cooking, and all cooking is "molecular" depending on how you choose to look at it. To borrow the examples used in the comment, I would submit that wd~50 and minibar are no more or less "molecular" than Bern's, and indeed no more or less "molecular" than a bakery. Tell me exactly what defining characteristics make wd~50 and minibar "molecular gastronomy restaurants." Is it that they alter the natural textures of ingredients? Then what of Bern's various foams paired with the caviar? Is it that they use hydrocolloids? What if Bern's is using methylcellulose or xanthan for its foams? Is it unusual ingredient pairings? How unusual do they have to be? Is caviar and curry enough? 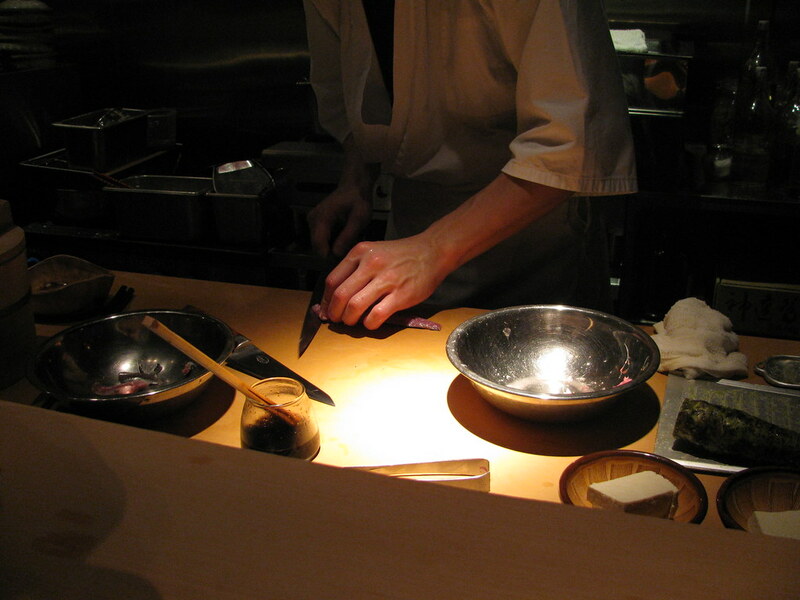 Here's my thought of the evening: all restaurants fall somewhere on a continuum between traditional and creative. 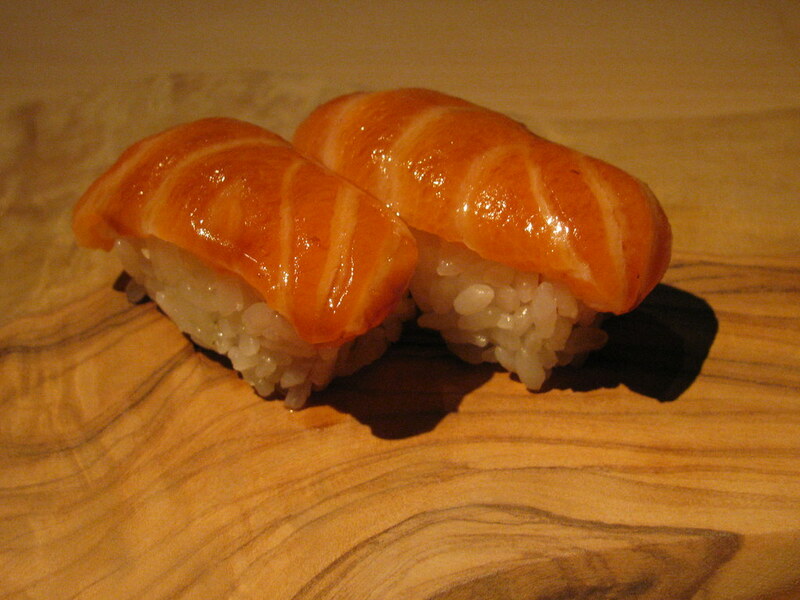 Both "traditional" and "creative" can refer to a number of things: preparation methods (both hardware, i.e., immersion circulators, and software, i.e., hydrocolloids); ingredient combinations, plating techniques, and so on. Some restaurants are more traditional; others are more creative, some truly cutting edge. But it is a continuum rather than a strict categorization. 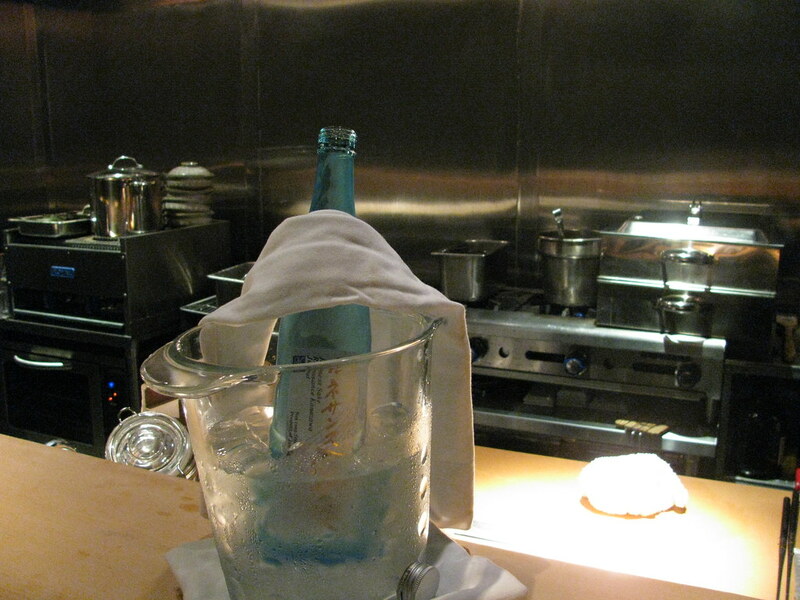 How can it be otherwise, when Bern's is serving caviar with six foams, and Alinea is serving Pigeonneau a la St. Clair? "It was the best of times, it was the worst of times." For South Florida diners, it might well be the truth. On the one hand, we are fortunate to have local talents like Michael Schwartz, Michelle Bernstein and Jonathan Eismann at restaurants that are reflective of each chef's personal vision and style, and seem to be finding an audience both with locals and the seasonal tourists. We've also had a massive influx lately of imported big-name restaurateurs making sizable investments in South Florida outposts, seemingly oblivious to the financial downturn (more likely simply the product of capital already committed before the economy turned south). On the other hand, there seems to be a stultifying sameness to many of the new places, particularly the foreign imports. BLT Steak, Gotham Steak, Red the Steakhouse, the upcoming STK steakhouse ... do you see a trend here? But I'd be far from the first person to bemoan the fact that steakhouses are becoming as ubiquitous as Starbucks in Miami, and won't do so further. Instead, let me get to the point. A couple weeks ago, I had the good fortune - though a cardiologist might disagree - of visiting two fairly celebrated steakhouses. The first was Bern's Steak House, a Tampa institution for more than fifty years and regarded by many as one of the finest steakhouses in the country. The second was one of the new foreign imported models, BLT Steak in Miami Beach, one of many spokes radiating from the New York hub of the Laurent Tourondel empire. It made an interesting opportunity for a compare and contrast. Bern's looks about a hundred years older than it actually is, because it is decorated in the style of a 19th century brothel. I say that with respect and appreciation. The governing principle of the decoration is that if there is a surface, it should be covered with red velvet, gilt, or if in any way possible, both. It is quite a sight to behold and doesn't look much different than the last time I was there, which was probably more than 20 years ago. While clearly an old-school institution, the restaurant is not fixed in amber. Indeed, they were ahead of the locavore trend, and for years have run their own farm which supplies many of the vegetables used in the restaurant (which, being a steakhouse, is not a ton, but still ...). Arriving there late, and solo, on a Monday evening, I asked to be seated in the more casual bar area in the front of the restaurant, and skipped the tour of the kitchen and wine cave that is customarily offered. I was brought a plate with a few crackers topped with some melted cheese, which looked unfortunately grey in the restaurant's dim light, and then was given the fat menu and the even fatter wine list. Bern's wine collection is possibly even more legendary than its steaks, with 6,800 selections and over a half million bottles. Only a portion of the collection is actually housed in the restaurant's cellar, with the rest stowed in a warehouse across the street. There are two things in particular I find especially appealing about Bern's wine list: (1) the incredibly deep collection of older American wines; and (2) the eminently reasonable prices for many of those wines, most of which were purchased by the restaurant upon their release. If there is a hole in Bern's massive wine list, it is the absence of half-bottle options; but given the prices, it was fairly easy to splurge on a full bottle even if I was dining alone. I told my waiter that I was interested in trying a zinfandel with some serious bottle age on it, that I trusted Ridge as a producer, and that he ought to help pick something good as he was going to be finishing off the bottle himself after I was done. He steered me to a 1977 Ridge Coast Range Zinfandel (priced around $60) that another diner had recently tried and enjoyed (he kept a notepad in his pocket to keep track of such things), which was decanted at the table. The common wisdom is that zinfandel is not a wine that ages particularly well, and that most should be drunk within about five years of release. Ridge, however, has a reputation for producing age-worthy zin, and this wine certainly reinforced that reputation. Despite thirty plus years in the bottle, this wine was still fully alive and vibrant; not the jammy flavors of most current zins, but elegant and layered, with a nose that suggested fallen leaves and hints of mushroom and forest floor among the dark fruit notes. It was a thrill to find something this old, and this well-kept, at such a reasonable price. I let the zin get some air while I started with a flute of Delamotte Le Mesnil Champagne and an order of American hackleback sturgeon caviar. Bern's offers 20+ different caviar selections in one-ounce portions, ranging from various flavored whitefish or tobiko roes for $25 to $220 Iranian Oscetra. The hackleback, one of my favorites of the American sturgeon roes, comfortably resided much closer to the lower end of that range. Along with some toasted brioche, it came with accompaniments that I found highly amusing - six different flavored foams! That most stereotypical and loathed conceit of the so-called "molecular gastronomists," here in this seriously old-school steakhouse? Say it isn't so! Does this mean we should now call Bern's Steak House a "molecular gastronomy restaurant"? Unfortunately, I can no longer recall all six flavors (lemon; onion; avocado; curry .... ?) but after sampling each, I stuck with the lemon or just a bare naked scoop of roe on the brioche. I elected to skip the soup which comes with every entrée and moved on to the salad. I usually do not care much about fussy service, but I am still a sucker for touches such as the chilled fork that was brought out with the salad. I believe my server said the salad had 12 different vegetables, many from the Bern's garden, but I have to confess that none particularly moved me. Next arrived what I had really come for - the steak. The steak portion of the Bern's menu takes up a total of five pages, and includes an explanation of each cut (and how Bern's butchers each - all butchery is done in-house and to order); pricing for various weights of each different cut (ranging from a 6 oz. filet mignon to a 60 oz. New York strip); a detailed description of the degrees of doneness you can request; and a lengthy discussion of their in-house dry-aging process. I went with a 10 oz. rib-eye, and it was one of the finest steaks I've had in a long time. The beef was clearly the beneficiary of good dry-aging, rendering it tender with a deep concentration of flavor. Most remarkable was that it had been trimmed so that there was not a bite on this steak that wasn't edible. 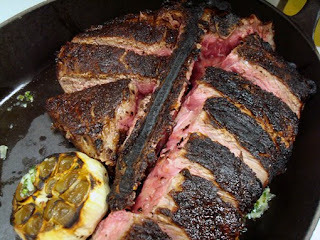 I actually like the "cap" on a rib-eye, which is usually separated from the rest of the steak by a thick line of fat, but this was trimmed like what I have more recently seen described as an "eye of rib-eye." When I mentioned to my server (after devouring every bit of the steak) that I liked the cap, he told me to just say so on my next visit, as every steak is cut to order and can be butchered basically however you want. The steak was accompanied by a perfectly pleasant baked potato with all the fixings, some slightly flaccid, soggy onion rings, as well as some rather nebbish vegetables from the Bern's garden - some shredded sauteed carrots with a hint of sweetness, which just seemed odd, and a few different types of wax beans, which were given an incongruous splash of soy sauce. I didn't save room for a trip to the "Harry Waugh Dessert Room." The truth is, I could have easily lived without everything at Bern's but the steak and the wine; but with just those two things, I could have had an incredibly satisfying meal. All the more remarkable considering that the rib-eye I ordered - which came with an onion soup, salad, baked potato, onion rings and vegetables - was $40. I know that seems like a steep price point to be talking about a "bargain," but relatively speaking - and particularly once the wine prices are factored in - that might well be an apt description of Bern's. Visually, at least, BLT Steak is the anti-Bern's. Stationed in the lobby of the Betsy Ross Hotel on the northern end of Ocean Drive in South Beach, BLT Steak is the embodiment of minimalism, a stark contrast to the baroque excess of Bern's. The space draws lots of natural light from the windows facing out on Ocean Drive, and everything is terrazzo, blond wood, and beige linen. The primary "decoration" is a large blackboard behind the banquettes inscribed in chalk with a tutorial on different types of beef. It is a surprisingly small space, with a bar off to one side, about a dozen or so tables in the main lobby space (which still also functions as the Betsy Hotel lobby), and another row of tables in a narrower space along the windows facing Ocean Drive. There's also outdoor seating on the front patio. Whereas at Bern's I could have just stuck with the steak and the wine and happily skipped everything else, it was the "everything else" that made for some of the biggest highlights at BLT Steak. 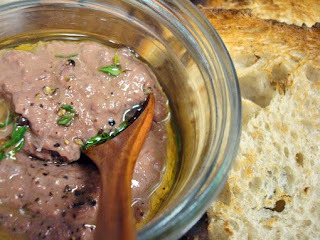 Indeed, one of the best things was one of the first to arrive at the table, a jam jar filled with warm, oozy chicken liver mousse, along with a similar jar of lightly pickled vegetables and some crusty bread. I don't know many people that enjoy chicken liver (at least not as much as I do), but I hope they're at least willing to try this - it may make them converts. These treats were followed by a tray with a gigantic popover for each diner, delicately crispy outside, tender and warm but not mushy or doughy within. I would be hard pressed to pick a favorite pre-dinner steakhouse spread between this and Bourbon Steak's trio of duck fat fries and truffle-oil soaked focaccia. In addition to the regular menu, which doesn't stray very far from the usual steakhouse staples (although it does offer more fish and seafood selections than usual, both in the appetizers and entrées), there was also a separate menu of daily specials which appears designed both to give the chef (the all-of-25-years old Samuel Gorenstein) an outlet for more creative fare, and to take advantage of seasonal local product. The specials menu offered both prix fixe and a la carte options, but I felt like I needed an abacus to figure it all out. The prix fixe offer included three courses plus a side dish (I believe it was for $60), theoretically from any of the items listed on the specials menu, but at least half the items had "supplement" charges if ordered as part of the prix fixe, ranging from $3 to nearly $20. Feeling too mentally taxed to figure it all out, we simply went a la carte. I started with one of the daily specials, a porchetta di testa. It was amusing to see that this was the exact same preparation as the one done by Chef Chris Cosentino of Incanto in San Francisco, as shown in this video; and one that I have already seen duplicated, in almost exactly the same manner, right down to the garnishes, by Chef Michael Schwartz at Michael's Genuine. One more dish to add to my list of "goes around ... comes around" items, apparently. It was good, possibly even a bit more refined than MGF&D's iteration, and I have no complaints with finding pig head on multiple local menus. Mrs. F started with a classic shrimp cocktail, something that's often good but tough to make really sing. In fact the only time I've ever had a truly standout shrimp cocktail was at Bourbon Steak (which, it seems, I need to go back to), where an extra dimension was added by a poaching liquid redolent with tarragon and other fresh herbs whose flavors were beautifully picked up by the crustaceans. The shrimp at BLT Steak were plump and sweet but not particularly special. Frod Jr. and I split a 40 oz. porterhouse, an impressive cut roughly two inches thick, with the sirloin and filet on either side deftly trimmed off the bone and sliced into big slabs. It was done closer to medium rare than the medium/medium-rare I'd requested (for Frod Jr.'s benefit), but the heat from the pan actually provided for some carry-over cooking of the slices left within. It was a good steak (though an unfortunate seam of fat running the length of the sirloin side was a distraction), with a nicely charred exterior from broiling at 1700 degrees (! ), but lacked the depth of flavor (and the conscientious trimming) of the steak at Bern's. A pat of herb butter on top was unnecessary, and a head of roasted garlic seemed very 1980's. We did have plenty of leftovers, and Frod Jr. and I had a steak sandwich, and a steak sandwich, for lunch the following day. We even tried to put it on the Underhills' bill. And that head of garlic actually came in handy to flavor a roasted garlic mayo for the sandwiches. Mrs. F and Little Miss F elected to split a swordfish - a decision I didn't fully support, particularly given the rather uninspiring menu description as "spiced grilled swordfish / olive oil & lemon." The only thing missing was the "spiced," and this was a bland dish if generously portioned. There were other intriguing fish options, including an acacia honey marinated Alaskan black cod and some local fish selections in the daily specials. As sides, we ordered some "crispy gnudi" from the specials list, along with onion rings and creamed spinach from the regular menu. The gnudi didn't really work for me, the exterior not so much crispy as just a bit gummy, and the rest of the components not really seeming to come together - a scatter of thinly sliced speck on top, a ramekin of butter on the side. The onion rings were big fat rounds of sweet onion, with almost a tempura style coating, stacked impressively into a tower. The creamed spinach was no better or worse than any other steakhouse version. Desserts were a big hit among the junior members of the Family Frod. The real surprise hit was a key lime panna cotta which Little Miss F ordered. Served in a big glass bowl, the panna cotta was quiveringly light but bright with zippy key lime flavor, topped with a creamy coconut sorbet that was an effective pairing. Frod Jr. can almost never pass up a molten chocolate cake, and was sucked in by the one on the specials list. I've had these too many times to get excited by them, but he's still young. The wine list, unsurprisingly, is no match for the list at Bern's. While fairly short, it manages to offer more options than just the typical panopoly of big California cabernets that are usually prevalent on steakhouse lists. The markups were wildly unpredictable, however. A 2006 Ridge Three Valleys zin, typically around $20 retail, was priced at $70+; on the other hand, a 2006 Alain Graillot Crozes-Hermitage, at $49, was less than 2x the average retail price of $30. Guess which one we got? (Hint: it was not the "base-model" current release from the same winery which produced a nicely 30+ year-aged wine that I bought for less at Bern's earlier in the week). The Graillot, a reliable Northern Rhone syrah, was a great match with the steak. Service at BLT Steak was smooth and solicitous, belying the stereotype of apathetic or worse South Beach service. Though it was quiet for a Friday night, sometimes those slow service nights seem to trigger a certain inertia in the staff. Not true here. The servers cooperated in taking care of tables, the manager stopped by mid-meal to check on us, and the sommelier complimented us on the selection of the Graillot. It's not often that somebody notices and comments favorably on a wine from the low end of the list's price range. So what's the point? I suppose there are a few. (1) overall, I had very pleasant meals at both Bern's and BLT Steakhouse; (2) despite both being "steakhouses," they are quite different places, with their own strengths and weaknesses, and perhaps it's too simplistic to simply lump all the "steakhouses" together; (3) despite my prejudices against steakhouses and even moreso those that are imported satellites, Bern's steaks and wine list alone are worth the visit, and BLT Steak is doing enough right to be worth checking out again - if for no other reason than the chicken liver mousse and popovers. In fact, there are now more steakhouses in Miami Beach than there are Starbucks. The Starbucks locator shows 9 stores in Miami Beach. Steakhouses? BLT Steak; Fogo de Chao; Gotham Steak; Parilla Liberty; Outback Steakhouse; Prime One Twelve; Rare Steakhouse; Red; Shula's; Smith & Wollensky; Texas de Brazil = 11. And that's not even counting recently closed Kobe Club and Tuscan Steak, or soon-to-open STK. Regular readers will know I don't think there is any such thing as a "molecular gastronomy restaurant" and hopefully the use of techniques such as foams in an old-guard restaurant like Bern's helps prove the point. One oddity of Bern's is that the bill includes a 12% service charge "to be given to your waiter in lieu of salary," with a note that "The option of a gratuity for fine service, of course, is yours." I frankly had no idea what to make of this rather ambiguous notation, and added about another 10% to the bill as tip - in addition to the glass or so I left behind of the Ridge zin my server had recommended. I noted in earlier posts the curious phenomenon of similar dishes multiplying like tribbles across menus throughout the country. Today, Food & Wine predicts that sea urchin will be the "Next It Sandwich," giving props to Michael White at the newly opened Marea, George Mendes at the newly opened Aldea, and El Quinto Pino, a tapas spot in Chelsea. One curious omission? Michelle Bernstein, who has had her uni sandwich (which was wowing folks at the James Beard Awards a couple months ago) on the menu at Sra. Martinez since it opened last December. At least the New York Times gave due credit when it ran a similar story last month, as did an earlier blogger's recounting of the genesis of the dish (sort of) at El Quinto Pino. Not that the increasing prevalence of uni sandwiches is anything to complain about, of course. Pacific Time was named in last year's list, Michael's Genuine Food & Drink was in the 2007 list, Cioppino in the Ritz-Carlton Key Biscayne in 2005 (I was as surprised as you - who knew? Of course, the chef mentioned in 2005 appears to no longer be there), Carmen the Restaurant (closed due to fire in 2006 and never reopened) in 2003, Pascal's on Ponce in 2000, and both Wish (with Andrea Curto, now of Talula, then at the helm) and Ortanique in 1999, so Miami is frequently on Mariani's radar. 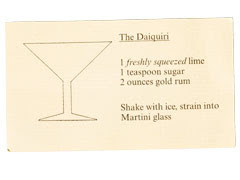 I've probably already said enough about Mariani, so instead let me just say "good luck" to all the Miami restaurateurs and chefs who get paid a visit by the "freelance corespondent" (he's not a "restaurant reviewer") who cracks out the business card with instructions for making a daiquiri. There are several local restaurants deserving of the recognition.